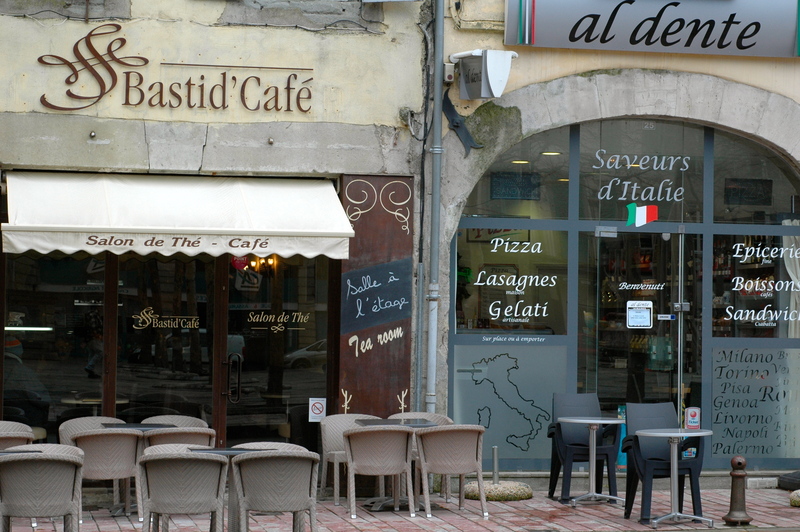 There are couple of things that I really like about Southern France. One of them is the table cloths and the fabrics. 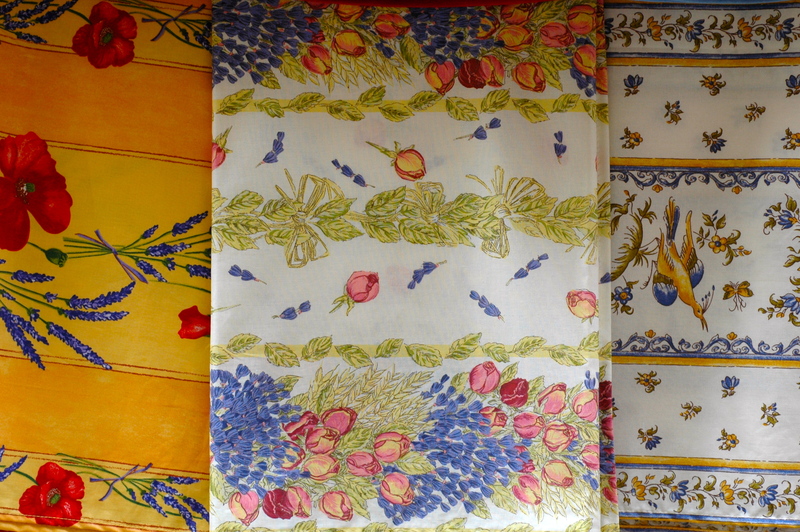 Yeap, I am very much into nice table cloth patterns, the kind you can find at Williams-Sonoma in US, and seeing them in Carcassonne made the ones I had more real. Le Cassoulet, the typical dish of the region, was really good. 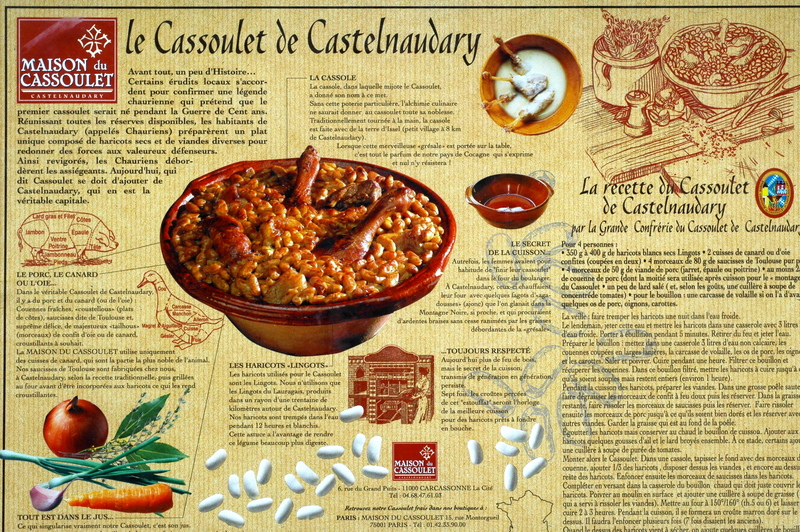 In all restaurants in Aude they serve Cassoulet. In some restaurants it is one of the options, in others that’s the only thing they serve. It is made of white beans, sausage and duck. As Mr. Fawlty (from Fawlty Towers) said in the famous series “If you do not like duck, you will get stuck”. Well, something similar here. BTW, it is really good. This was the first time I tried duck and all I can say is that the way French do it, it tastes much better than chicken. I love how even on cloudy days people are drinking their coffee outside. When it is raining people are still sitting outside; With their umbrellas open, with the their newspaper and their cafe. I also love that everything is in French. Yes, I know we are in France, it is supposed to be in French. 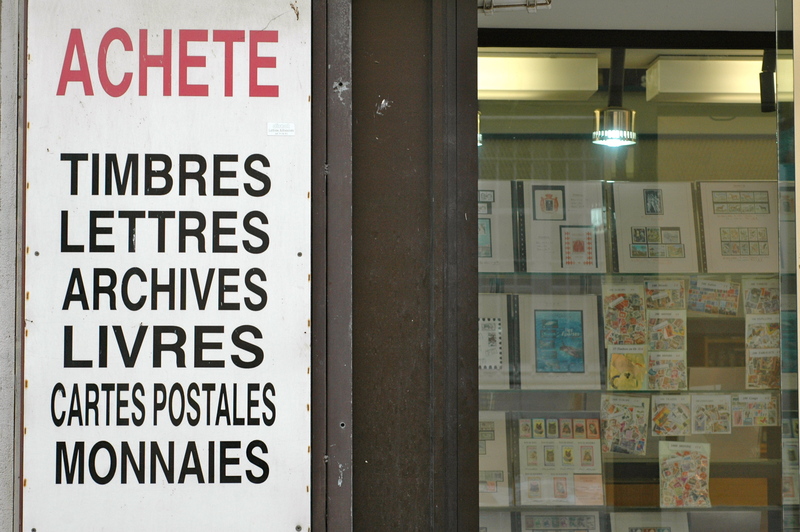 Still, it makes me smile and fall in love with French language over and over again. Plazas are beautiful in Carcassonne. 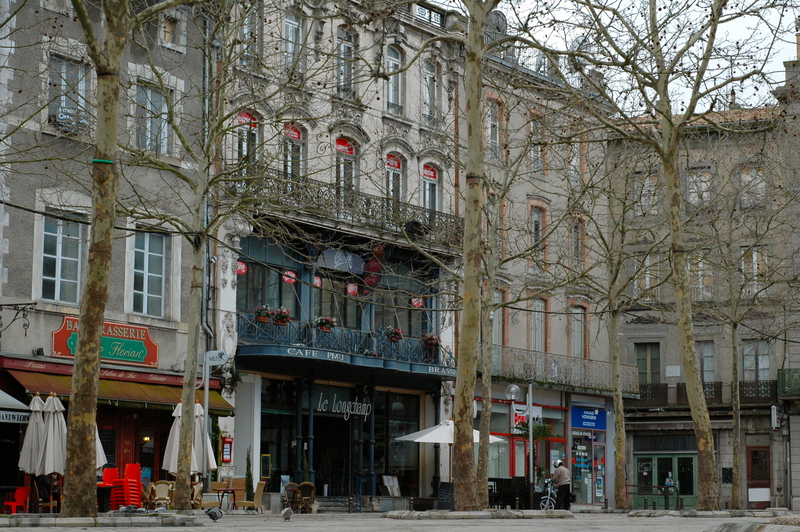 There are lots of trees, cafes, stores. This one holds a lot of charm and we ended every day on this plaza drinking coffee, walking or visiting farmers market. Red and white cups. 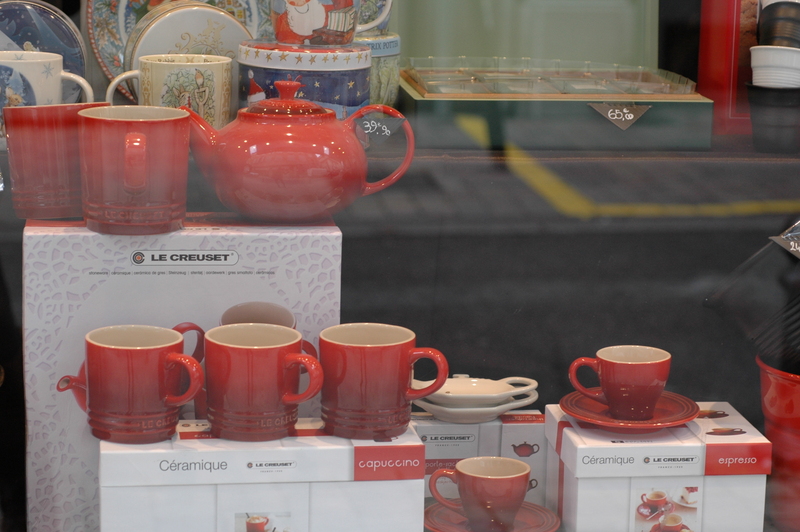 I had those at home for a while, but seeing them in a store window in France made me smile wide. The color combination and the quality of the ceramic enhance my morning coffee experience every day. This multiplied by three morning coffees daily means really enhanced mornings. Pastries in Cathare region reminded me of Russian bakery. As a kid my mom tried to bake those peaches, but they never came out nicely. Then, we used to buy them in the pastry shop sometimes or friends would bake them and bring them over. Seeing them in France brought some sweet memories. And yes, we got a box of those! Those small things in the middle row are called Cannelés. 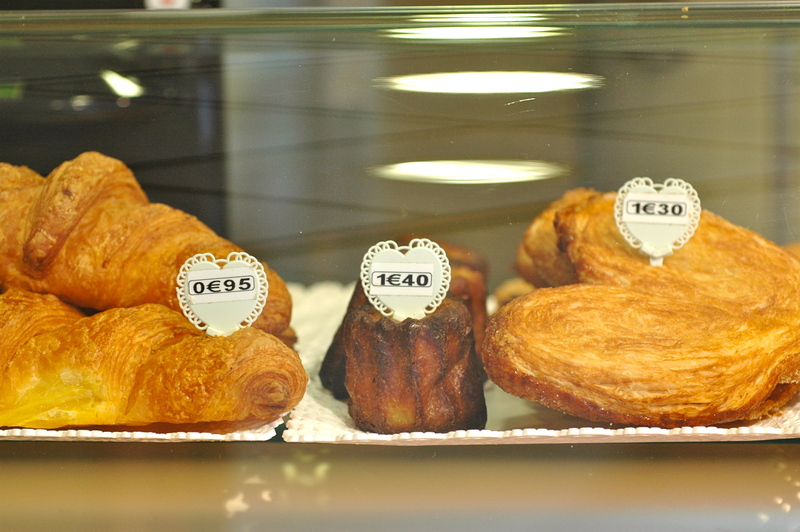 Yeap, the ones that are 1.40E, they are also refereed to as humble French little cakes from Gironde & Bordeaux. Now I know that there must be a way to make them ok inside without burning the outside. And well done they taste very good. 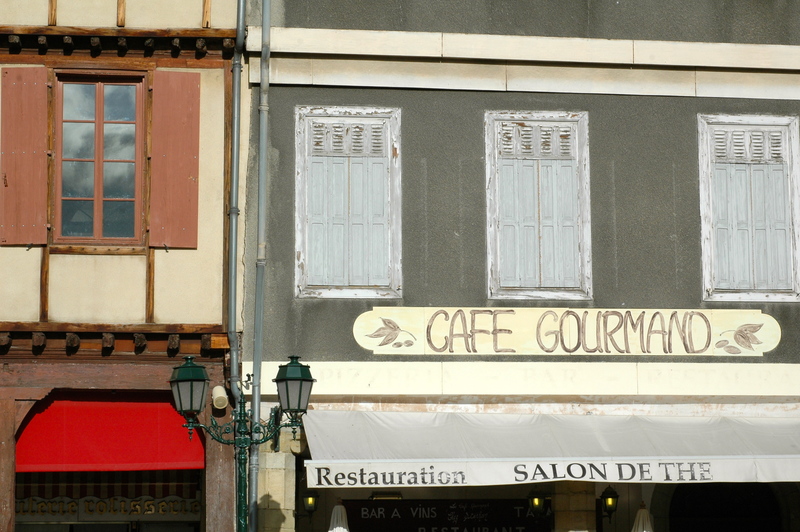 The houses in Limoux: Everything looks old, but cared for. It is real, people still use what was built hundreds of years ago. They live there, they do their business there. These long lasting relationships with things and land hold the real magic. 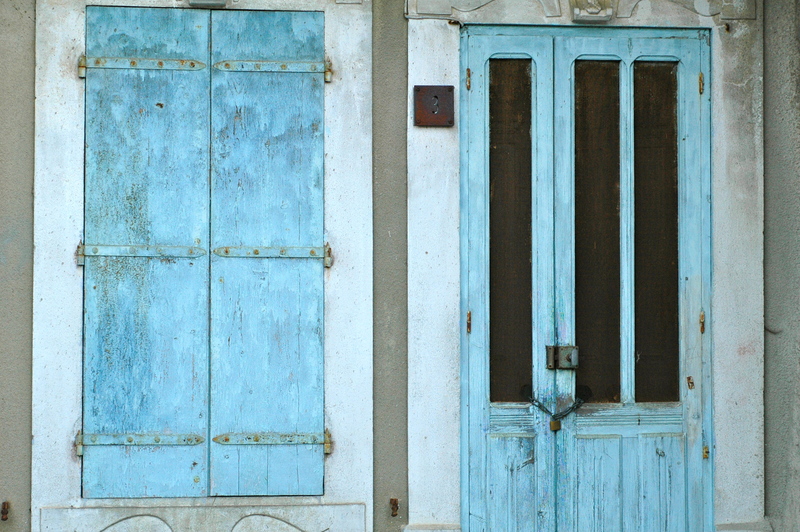 The houses and shutters are painted in different shades of blue. This one was one of the most beautiful combinations I saw. I know, it is old, but I still find it lovely. It made me dream of living in a house like that and seeing the hills with vineyards from the windows. 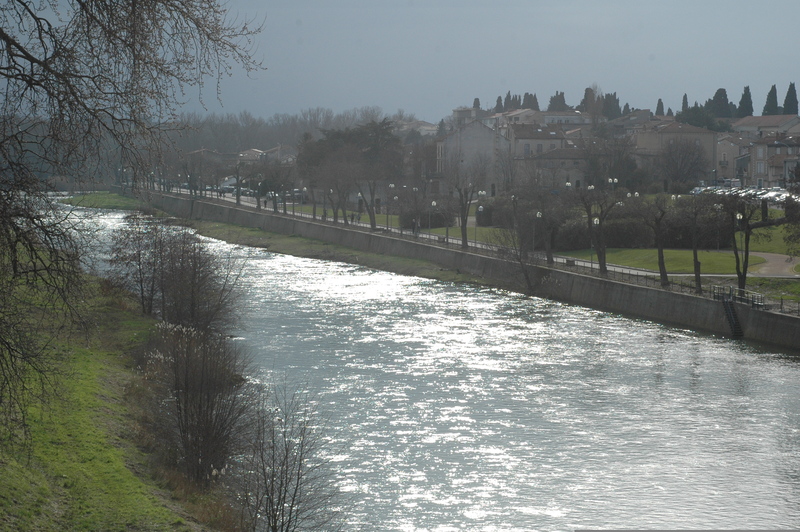 One other thing I love about France is its rivers. They are wide, full of water and always moving. The rivers in France are like Russian rivers: strong, fast, dangerous and helpful. They are not a mere decoration, they are useful. Thus, it made me a little bit nostalgic crossing rivers in France. It also formed a strong attachment to the beautiful Languedoc. This entry was posted in France, Travel and tagged Auge, Cannelés, Carcassonne, Cassoulet, France, Languedoc, Southern France by Masha Kubyshina. Bookmark the permalink. In the rain under umbrellas ? Wow ! 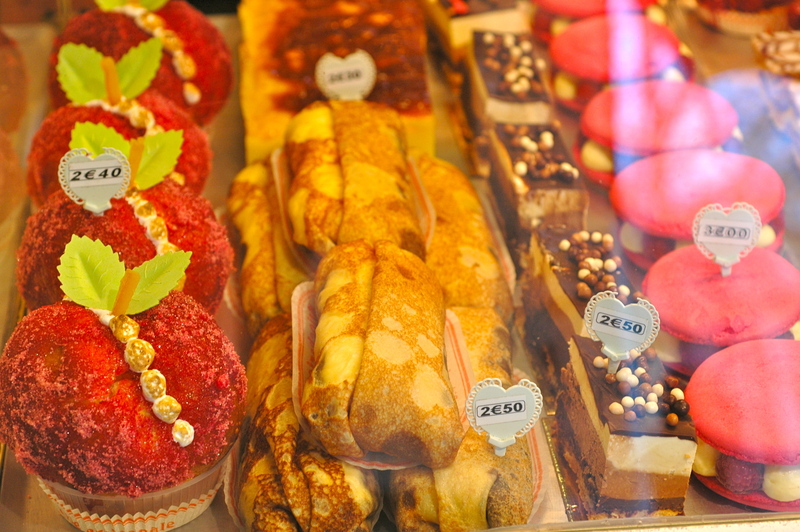 Those pastries look divine ! Thank you, Tasha! France is wonderful place to visit / live.